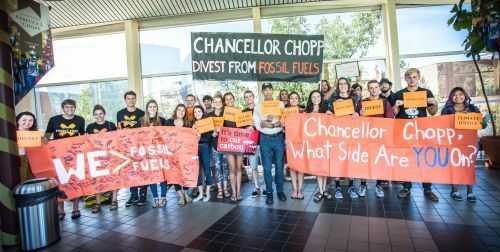 Students stand on Driscoll bridge with signs addressed to Chancellor Rebecca Chopp urging her to divest DU from fossil fuels. Copyright restrictions may apply. User is responsible for all copyright compliance. “Divest DU 2,” University Libraries Online Exhibits, accessed April 21, 2019, https://exhibits.library.du.edu/librariespresents/items/show/6067.